There's nothing quite like that special mix of excitement and anticipation that comes along when one of your favorite bands releases a new album. Are you going to be overwhelmed? Disappointed? Or even worse, unmoved at all? Well, the postman delivered a gorgeously-shaped 12" x 12" package today and inside was the answer to that question for me. I'm happy to report that Handwritten, The Gaslight Anthem's newest album, ridiculously exceeds any hopes I could've held for another stellar release from them. 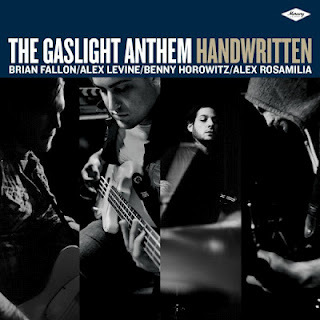 Working fluidly as a complete album, as well as a fantastic collection of individual songs, Handwritten contains some of Gaslight's best musical moments and some of frontman Brian Fallon's most heartfelt and intelligent songwriting. Just like with their last album, 2010's American Slang, they continue to step even further out from the shadows of their influences and authoritatively define their own sound again and again. But don't worry, there's still enough of the respectful musical nods and clever lyrical touchstones that we've come to expect from the Jersey boys to make it feel like a full-fledged Gaslight effort. After a couple of spins through Handwritten, one of the things that struck me the most was the strength of the album's overall cohesive flow and the attention that was paid in putting together the tracklisting. When a band has a variety of styles and moods it can create within, sometimes an overall album can feel like a disjointed mixtape. Handwritten doesn't suffer from this problem at all and it's easy to tell that the songs weren't just haphazardly slapped together. From the explosive kick-off of "45" to the quiet closing strains of "National Anthem," Handwritten shows a band that knows their strengths, knows how to stretch themselves and knows how to tell a story in both lyric and music. The Gaslight Anthem is beyond trying to just grab your attention for a second. Handwritten is an invitation to a conversation, a bigger story you can find yourself in and the open letter of a band that's around for the long haul, who hopes that you will be too. Although we've had "45" to be familiar with for a little bit since it was the first single released, the song still blasts open the album's doors with a resounding entrance. It seems once Gaslight has gotten your attention, they simply refuse to let go. The same pulsing energy, either carried by the full band or at least one of the instruments, is felt solidly throughout the next few tracks. "Handwritten" is driven by Benny Horowitz's pounding drums and some nice singalong background vocals, "Here Comes My Man" saunters along on a great guitar line and fantastic drum tones and "Mulholland Drive" contains not one, but two scorching solos courtesy of lead guitarist Alex Rosamilia, along with a hammering bassline from Alex Levine. "Keepsake" and "Too Much Blood" feature that soulful R&B-flavored Gaslight swagger that is so prevalent on a lot of their work and both blend in nicely between the more straight ahead rockers. "Howl" is in and out in barely over 2 minutes and I absolutely love the frantic punk vibe that's reminiscent of the songs on their debut album. Fifth man Ian Perkins turns in some great rhythm guitar work on this one and when played live, Brian gets to go guitarless for a little bit and have a little unencumbered fun. The powerful punch and sway combo returns on "Bilouxi Parish," one of the "oldest" songs on the album that started showing up pretty soon after their last full length. It's in a slightly different version here though as one of the verses they played live has been tossed for a killer new bridge. "Desire" does a pretty good job of straddling that rocky-punk song vs. punky-rock song line and serves as a great thumper before the final two emotional closers. "Mae" bubbles and builds like an amped-up U2 song (who are in my opinion, possibly the best at letting songs breathe and build perfectly) and creates a really nice sonic wave that could really be lengthened and jammed on a bit in concert. "National Anthem" closes the album out in that grand "Gaslight folk" fashion that reminds you how amazing a singer and how fantastic a songwriter Brian Fallon really is. While the song is fleshed out with other atmospheric instrumentation, the lion's share of the beauty is carried out with Brian's finger-picked acoustic guitar, his ragged voice and his rock solid melody. For such a high-energy album, this relaxed ballad makes for a nice, natural exhale and a gorgeous sonic sign off.